Made by Eastman Kodak Company, Hawk-Eye Works, Rochester, NY. 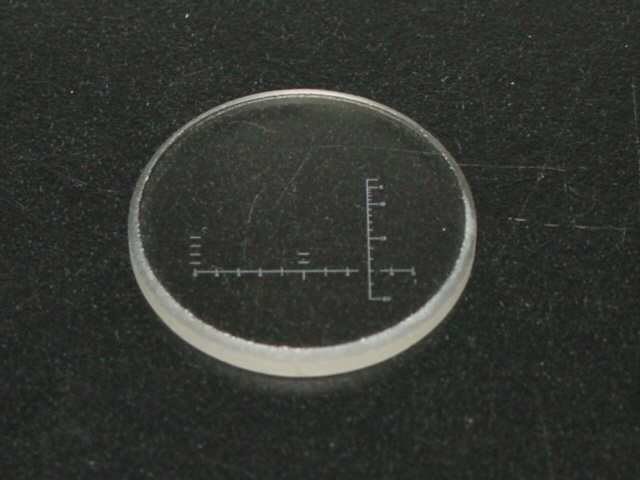 Beautifully-made 21mm diameter x slightly over 1mm thick clear glass reticle. Ground and beveled edge. Scale has 11 graduations on the horizontal axis, with 5, 4, 3, 2, 1, 1, 2, 4, and 5 values; 16 graduations on the vertical axis, with 5, 10, 15, and 20 values. There are secondary vertical graduations, four above the horizontal axis left-hand 5 and two above the horizontal axis 0. Unused stock, in the original wrapping and sewn Eastman Kodak paper packet (product# B-173980).